UPDATED: Sat., April 1, 2017, 11:18 p.m.
Monday, April 3: Gonzaga vs. North Carolina, 6:20 p.m.
GLENDALE, Ariz. – The games keep getting bigger. Gonzaga keeps getting better, particularly in crunch time. 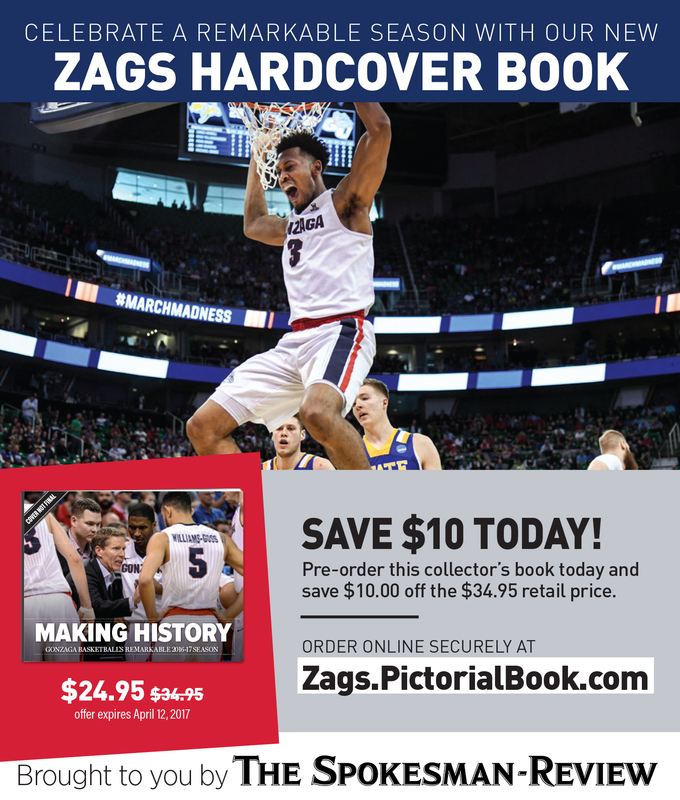 The top-seeded Zags tacked up another landmark victory, holding off seventh-seeded South Carolina 77-73 Saturday in front of 77,612 at University of Phoenix Stadium, the second largest crowd in national semifinal history. Gonzaga (37-1) celebrated its first Final Four appearance by advancing to the championship game on Monday where the Bulldogs will face No. 1-seeded North Carolina, which defeated Oregon 77-76. To get there, Gonzaga needed to withstand a South Carolina comeback that turned GU’s 65-51 lead into a 67-65 deficit with just over seven minutes remaining. Enter Zach Collins, Przemek Karnowski and Nigel Williams-Goss. The trio led the Zags most of the game and even more so in the tense, closing minutes. Gonzaga rattled off a 7-0 run to jump back in front 72-67. Collins started it with a 3-pointer and Karnowski, who left the game late in the first half after being poked in the eye, made the next two baskets on feeds from Williams-Goss and Collins. In the final moments, the Gamecocks (26-11) pulled within two on a Chris Silva free throw. A Collins’ free throw restored the lead to three. South Carolina set up for a potential tying 3-pointer but the Zags didn’t give the Gamecocks the chance. Josh Perkins fouled with 3.5 seconds left before they could get a shot off. Sindarius Thornwell made the first free throw and missed the second on purpose. Killian Tillie grabbed the rebound and was fouled. He made two free throws to ice the win. Williams-Goss poured in 23 points, equaling his tournament high, on 9-of-16 shooting. He added six assists and five rebounds. Collins contributed 14 points, 13 rebounds and six blocked shots. The Zags were efficient, shooting 48 percent and connecting on nine 3-pointers, but it was at the other end where Gonzaga did its best work. The Zags shut down Thornwell, holding the tournament’s leading scorer (25.8 points per game) to just 15 points. Mathews, Williams-Goss, Silas Melson and Johnathan Williams all took turns defending the 6-foot-5 wing. Thornwell made just 4 of 12 shots. By doing so, the Zags put themselves 40 minutes from a national championship. Published: April 1, 2017, 5:29 p.m. Updated: April 1, 2017, 11:18 p.m.